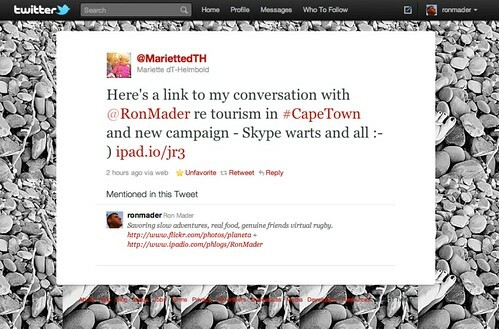 Here is the recent conversation with Cape Town Tourism CEO Mariëtte Du Toit-Helmbold who always inspires. I had the privilege of meeting Mariëtte earlier this year at the Responsible Tourism in Cities Workshop. What I love dearly is how she integrates social web with being social. The new tourism campaign — "You don’t need a holiday. You need Cape Town." — is inventive and inclusive. 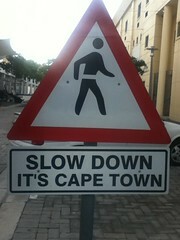 My take: we need Cape Town! The city a living, breathing example of responsible tourism in action. A technical note: our conversation was recorded using skype and there were a few glitches. So here is the chat, skype warts and all. Stories are becoming the unique selling point. The people – the flesh and blood – are an integral part of tourism. There are lots of places around the world with pristine beaches, but the people and the stories are what distinguish the place. The world’s visitors are looking for authentic and meaningful experiences and they are looking for connections with people. Unless a campaign resonates with the people of the place, it does not have the legs to carry it forward. The campaign is flexible to use. We want stakeholders to own it and use it as their own. 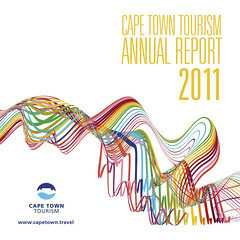 Details about Cape Town's new promotion and a video from the campaign launch are online Capetown.travel. I'd also recommend following Mariëtte on Twitter.